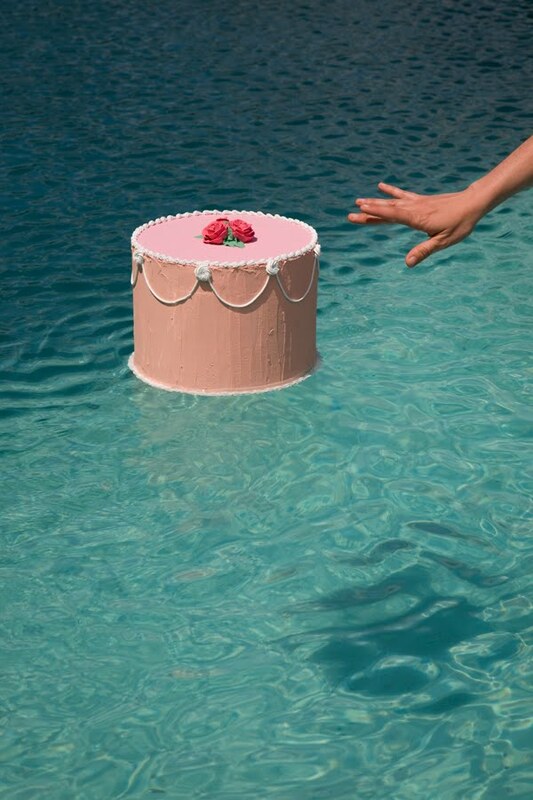 Work from Nine Fake Cakes and Nine Bodies of Water. “I photograph worn, dilapidated objects with a history that expresses loss and sadness. These forms are ultimately self-portraits, communicating to the viewer significant memories that I am unwilling to let go. Spring 2010 featured several personal and career related disappointments and for the first time in my artistic life, I was devoted to a project that\’s main premise is beauty, escapism and desire. 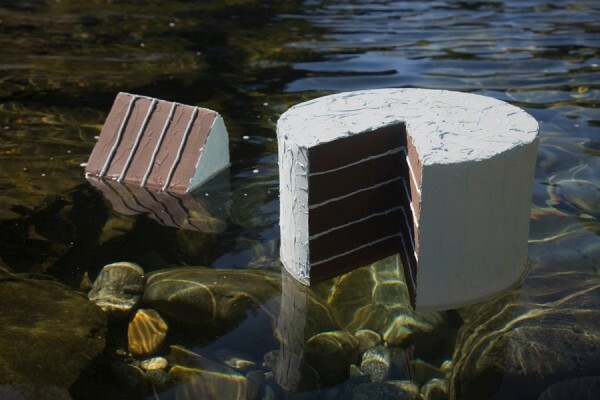 Complete immersion in finding inviting bodies of water to float Styrofoam and acrylic-tinted, caulk cakes was a coping mechanism to come to terms with loneliness and unhappiness with place. Cakes, both real and fake, appeared to make people happy and I wondered, most simply, if they could make me happy too. 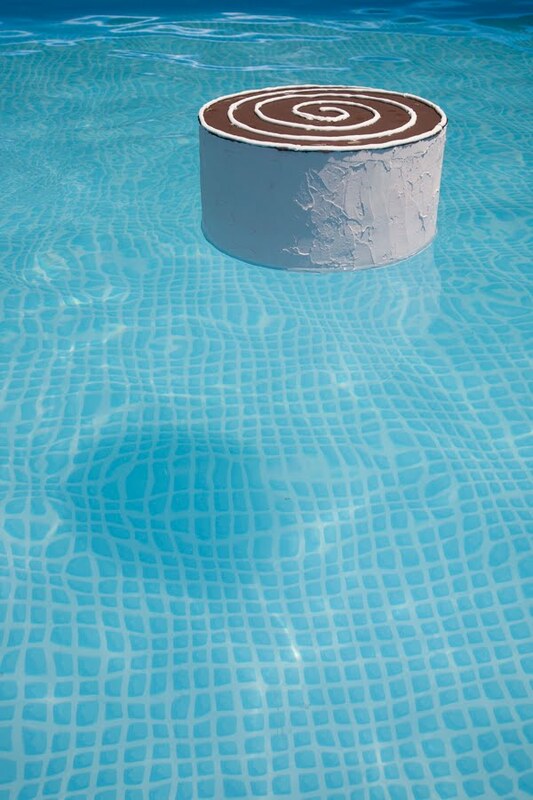 Two of the most desirous objects in 20th century art are Wayne Thiebaud’s thickly textured paintings of desserts and Ed Ruscha\’s photographs of azure swimming pools. They were my biggest inspirations as I sought ways of combining them, creating a mixed media spectacle of performance art, sculpture, and photography. Ed Ruscha is a frequent reference in my artwork and the number nine was chosen in homage to his famous series Nine Swimming Pools and a Broken Glass but I expanded the locations to include not just artificial pools of water but natural springs, the ocean, freshwater lakes, and rivers. I didn\’t stray too far from the concept of object as self-portrait. The Slice depicts the part of me I left home in the Pacific Northwest (as photographed in the Canadian Southwest) when I moved to Indiana. The Desert Sun captures one of the happiest times in my life in one of my favorite places (Tucson, Arizona) while the 3-tier photographed at Niagara Falls acknowledges one of the saddest. The cake deemed Little Great Lakes, the smallest of them all, shows an underlying determinism and hope as it bravely faces the incoming waves, only to be toppled over time and time again. The sheer amount of help I received from friends and strangers, the bending of the rules to take many of the photographs, the postcards sent between each location, and the performances that ensued during the flotations are nearly as important as the images themselves. For merely nine prints, this is the most extensively documented project I have ever conceived. The cakes, many displaying the ruins of their initial floats (cracks, bleeding acrylic paint, missing decor), will be displayed on glass plates accompanying the photographs. An artist\’s book will soon be published documenting all aspects of the process. The entry 'Jacinda Russell' was posted on August 25th, 2012 at 8:55 pm	and is filed under Uncategorized. You can follow any responses to this entry through the RSS 2.0 feed. Both comments and pings are currently closed.